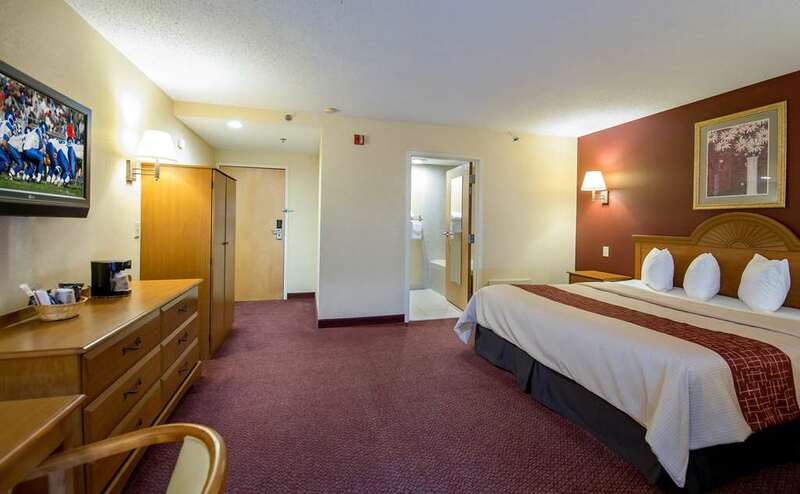 Red Roof Inn Clifton Park is conveniently located off of the Adirondack Northway (I-87), just minutes from Saratoga Springs. This Clifton Park, NY hotel is close to the Empire State Plaza, Saratoga Race Course, Saratoga Performing Arts Center, and the Times Union Center (formerly the Pepsi Arena). Universities and colleges close to the hotel include State University of New York at Albany, Skidmore College, Albany Medical College, Union College, and Siena College. The historic Proctor's Theatre, Lake George Village and the West Mountain ski area are minutes away. New York's Adirondack Mountains and Vermont are about one hour from the hotel. With the cities of Albany to the South and Saratoga Springs to the North, there is never a shortage of activities and events close to this location. Whether you take a hot air balloon ride over Saratoga and Lake George, enjoy a wine tasting in downtown Saratoga, go snow skiing in Schenectady, or enjoy a visit to The New York State Museum in Albany, Red Roof Clifton Park is ideally located central to all of the activity.